The future for all blind men can be the same, however blinded. 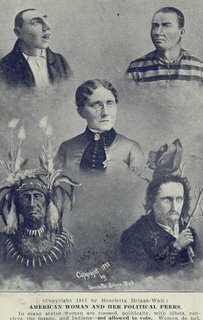 No longer dependent on a member of the family, a friend or a paid attendant, the blind can once more take up their normal lives as nearly as possible where they left them off, and each can begin or go back to a wage-earning occupation, secure in the knowledge that he can get to and from his work safely and without cost; that crowds and traffic have no longer any terrors for him and that his evenings can be spent among friends without responsibility or burden to them; and last, but far from least, that long, healthful walks are now possible to exercise off the unhealthy fat of inactivity and so keep the body strong and fit. Gentlemen, again without reservation, I give you the shepherd dog. 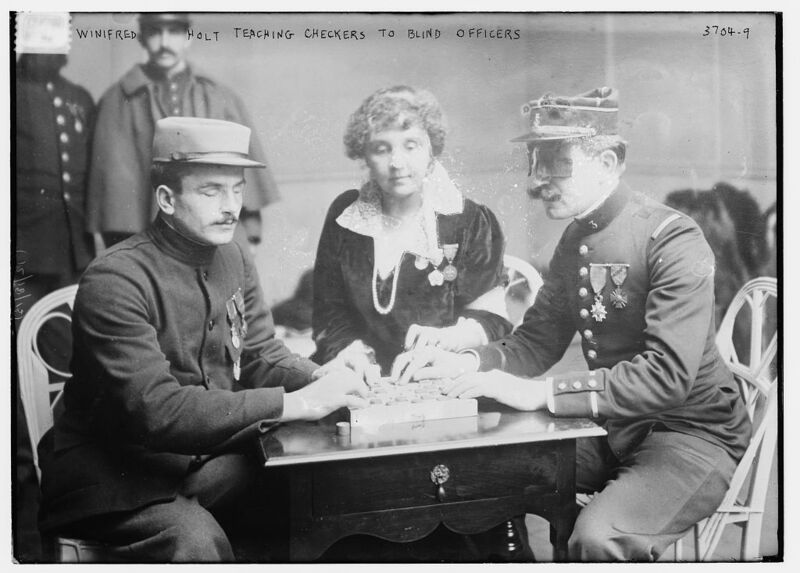 Morris Frank, a young American insurance salesman who was blind, contacted Eustis after the article appeared, and proposed that they join forces to start a similar school in the US. From their alliance, the Seeing Eye organization was founded. Eustis trained "Buddy" as Frank's guide dog (Frank, Buddy, and Eustis are pictured at left). 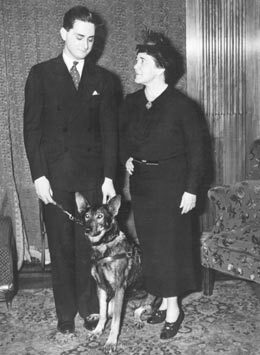 By the time Eustis retired from the presidency of Seeing Eye in 1940, the program had trained and placed more than a thousand dogs for guide work. (The organization still trains and places nearly 300 dogs a year.) There was a television movie made by Disney that tells a version of the Frank and Eustis story, titled Love Leads the Way (1984), based on a book by Morris Frank. 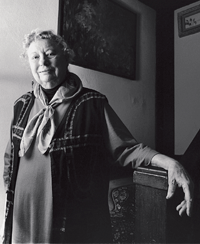 The Berkeley Daily Planet website features an obituary today for Willa Klug Baum, who died recently at the age of 79, following back surgery. Baum was an oral historian, author of an important text on methodology, and a founding member of the Oral History Association. In her work as the longtime director of the Regional Oral History Office at the Bancroft Library, UC-Berkeley, she oversaw and supported many projects, including the collection of oral histories related to the disability rights and independent living movement: the Bancroft's invaluable and growing collection on this topic now contains more than a hundred interviews with the leaders and founders of the movement in the 1970s. Said Baum of her own leadership approach, "I give myself credit for knowing a good idea when I heard it and then working to make it happen." The DRILM collection was one incredibly good idea. 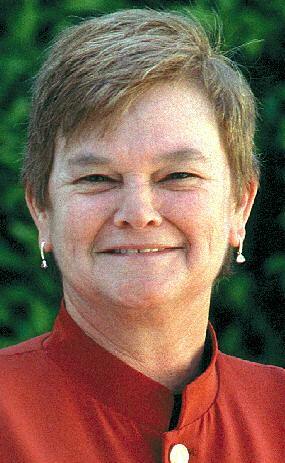 RIP, Willa Baum. The next was a receipt from a graduate nurse who had been engaged to nurse a little hunchback boy through a severe attack of measles, in one room in an alley down on N. 10th St. This boy has long been a patient of the Orthopedic Department, and when he contracted measles and it was impossible to put him in the contagious ward of the Children's Hospital because of its over-crowded condition, the only solution of the problem of his cure seemed in securing a private nurse. The mother, a foolish sort of person, was utterly unable to look after him. On account of his bad back it seemed inadvisable to send him out to the City Contagious Hospital. A few days' expert care in his own home pulled him through the worst of his trouble, and the mother, after watching the nurse and being instructed by her, was able to go on with his care. The Provident Association met the emergency of the mother's being obliged to give up her work, by sending provisions and coal, and as soon as all danger of contagion was over, the boy was brought back to the hospital, from there to be sent to the Convalescent Home. 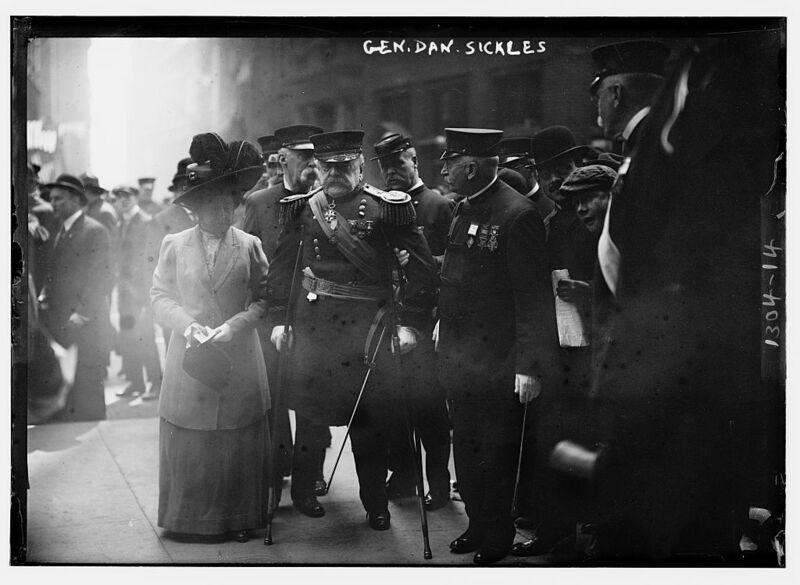 Julia C. Stimson (1881-1948), nurse and social worker, would later serve as head of the Red Cross Nursing Service and chief nurse of the American Expeditionary Forces during WWI, superintendent of the Army Nurses Corps, first dean of the Army School of Nursing, and president of the American Nurses Association. I ran across the above extract because today (May 26) is the 125th anniversary of Stimson's birth. He wanted to know whether he was to go ahead with the celluloid jacket and brace for a little Italian boy in the ward who three years ago had been shot in the back and had been unable to move below the waist ever since. The doctors wanted to put this apparatus on the boy but his parents were unable to pay for it. The brace maker was told to go ahead with the order, as the interest of a special Sunday School class had been enlisted and they had agreed to be responsible for the cost. If Stimson isn't exaggerating, nearly her entire workday involved finding care, placement, and funding for children with disabilities. She's not the first disabled child to be killed by her mother, but she's one of the latest. And the Katherine McCarron story has autism bloggers and others feeling a need to remember and protest. Wednesday, Autism Hub members will be posting on the story; Thursday, the Autism Hub will be "closed" for 24 hours, as a gesture of respect; Friday, the Autism Hub will reopen as usual. Already commenting: Kevin Leitch; Ballastexistenz; Kassiane; Kristina Chew; Dave Reynolds, ABFH...there are surely others, but this is a start. As promised, a mid-May edition of the Disability Blogs Roundup. You'd think the job was made easy by Blogging Against Disablism Day at Diary of a Goldfish--there were something like 117 blogs posting on disablism/ableism on May 1, including DS,TU. I won't repeat the collection here, but it's definitely worth a browse--it includes two German-language blogs, and one blog in Chinese. But no.... in the weeks just before and after BADD 2006, there have still been plenty of interesting posts to make our roundup here, too. We just passed Mothers' Day in the US, and a few roundup regulars made note: Kristina Chew remembered the "refrigerator mothers" of autism's past (and present too, sadly--the mother-blaming is far from forgotten); in a lighter vein, Mark Siegel encountered a Mom screening dates on Match.com (he seems to have passed the Mom's test, anyway). In the news: The Gallaudet student protests seem to have ended for now, but read through the events of recent weeks at Deaf in the City, or DeafDC. Mark Siegel (again) and Kristina Chew (again) commented on the case of Jared Guinther, the Army recruit who was released from his contract when his autism diagnosis became known; Liz Spikol caught this Katrina aftermath story, and has been collecting stories about Iraq War veterans' mental health. And at Edge-Centric, analysis of the "Story They've All Been Waiting For." Jesse Kaysen at the Media Circus blog on Ragged Edge found the New York Times story on a "special" ballet class "sticky" (for an alternative reading, check Croneway's personal response). Oh, and it turns out you can stab your disabled roommate to death in New Zealand, and the judge might believe it was about mercy. Disturbing developments: the National Autism Association's controversial new "Butterfly" ad campaign has Kristina Chew musing on the appeal and danger of fairytales, while AutismDiva calls it "creepy". 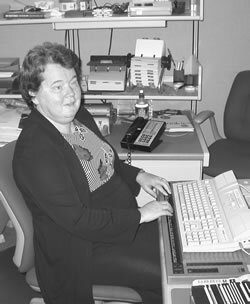 The National Library Service has suddenly taken web-braille offerings offline--see Ahistoricality's tale; here's the Ragged Edge roundup on the topic; and yes, there's a petition (photo at left shows Judy Dixon, one of the architects of web-braille). Angry Gimp and Chaironwheels are talking about CILs gone wrong (or at least gone lost under paperwork and funding shortfalls and other pressures). BlindConfidential's been covering the efforts of Apple to patent some audio feedback technology (in a series of posts, starting here, then here, then here, and more here). And why did the London Times send Rod Liddle to review Dans le Noir? Access and travel are perennial subjects here: GetAroundGuide and Rolling Rains always have good posts on the subject. Dave found that his detailed planning was too often for naught on his recent holiday in Darwin, because at airlines and hotels, "people just don’t care about details - even though they appear to." Pretty much the same story in Albuquerque, it seems: "[Reward] Points are nice, but I’d rather take a shower without having to call someone," explains Katja at Broken Clay. (On the other hand, English blogger Lisy Babe was delighted with the accessibility of San Francisco on a recent visit.) New blogger Cheryl at Steps wasn't traveling, just trying to go to an "accessible" theatre that wasn't so accessible after all. And Katja (again) is curious about the steps in front of a "wheelchair-friendly" two-story model house. (Access hidden in a closed garage isn't exactly "visitable" or welcoming, she notes.) Meanwhile in London, Damon Rose is on Cinema Watch--keeping track of which theatres are showing which movies with Audio Description. Then there's the ever-popular genre of unhelpful advice. Gimp Parade has a newsflash for medical professionals: sometimes disabled people get sick or hurt. Gimpy Mumpy was told by a physical therapist to try and "Move normal." Someone has an advanced degree and that's the best they can offer? Wheelchair adventures: Charles Dawson was fixing up an old wheelchair that apparently once belonged to "Doris"; Sarah reposted Harriet McBryde Johnson's recent NYTimes Magazine essay, "Wheelchair Unbound"; Sally spent a lovely day at the accessible Salisbury Cathedral (right)--before her van was damaged on the way home, by a hit-and-run (they caught the guy). Ziggi at Wheelchair Diffusion just says "It's about enough"--people should have chairs that work for them. Seems basic, doesn't it? Ending on the high notes: Google is rolling out a more accessible audio CAPTCHA verification scheme; Blind Chance is beginning its third year as an audio blog; Teri at Crip Chronicles recommends the "Helping the Handicapped" photo essay and speech (go have a look, and understand the irony in artist Ju Gosling's title). Estee Klar is preparing for an Outsider Art exhibit and lectures in Toronto (outsider art is getting a run in England too, with some controversy). And be sure to check out Dave Wallace and Mike Seyfang's new podcast, "The Extraordinary Everyday Lives Show"--it's not exclusively about disability, but that's part of the Australian show's focus. A final heads-up: The Society for Disability Studies meets in a few weeks in Bethesda; I won't be there, but Eastern bloggers might be. Meanwhile, here's one presenter's SDS paper, already online. Black history, disability studies and performance scholars work together to remember Montgomery women Anarcha, Lucy and Betsey. Come and join us for a discussion of Anarcha and J. Marion Sims, the gynecologist who used slave women as experimental subjects while searching for a cure for fistula. We would love to hear from you about what you know about this story, how the local sites are marked, what the story means to you, how you remember it locally, and how you see its effects on race relations and medical practices today. And we would love to tell and show you how we go about using movement, words and visuals to connect Anarcha's story to disability culture history and black history. And while we're mentioning Carrie Sandahl.... Bodies in Commotion: Disability and Performance (University of Michigan Press 2005), co-edited by Carrie Sandahl and Phil Auslander, was just awarded the Best Book Prize for 2006 from the Association for Theatre in Higher Education. It's part of the Corporealities series of disability studies scholarship from the University of Michigan Press (David L. Mitchell and Sharon L. Snyder, series editors). Congratulations to all involved! No textbook or other instructional materials shall be adopted by the state board or by any governing board for use in the public schools that contains any matter reflecting adversely upon persons because of their race or ethnicity, gender, disability, nationality, sexual orientation, or religion. Kuehl (once known for her portrayal of Zelda Gilroy on "The Many Loves of Dobie Gillis") was one of the first women admitted to Harvard Law School, and is the first openly gay or lesbian person elected to the California legislature. She notes that if textbooks are "silent about the diversity of talented people who were important in California, the impression is that only white, straight men did anything important. That leaves virtually everyone else in school believing their talents may not be sufficient." Maybe make that white, straight, able men? The disability clause is already part of the current law, and has been since 1987. Has it been enforced? I'm curious if it's ever had an impact. 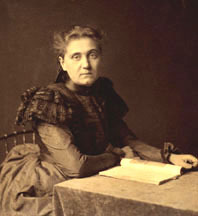 Under the new version (if passed), will California high school students in American history courses get to know that (for example) Hull House founder and Nobel Peace Prize winner Jane Addams (left, 1860-1935) was both lesbian and disabled (from spinal tuberculosis as a young child), and maybe talk about what it meant that she often had to conceal both these central elements of her life? How both might have shaped her work? What's the Bain Collection, you may wonder...well, thanks to the Magpie, I now know that it's about 1600 images from a collection of 42,000 glass negatives, mostly American news photos from the early 20th century. Why is this so cool? Well, click on over to the search page. Don't bother typing in "disability" or "disabled"--those words won't bring up anything. But typing in "blind" or "cripple" will bring up loads of photographs, many of them taken at schools and rehabilitation or vocational training programs. 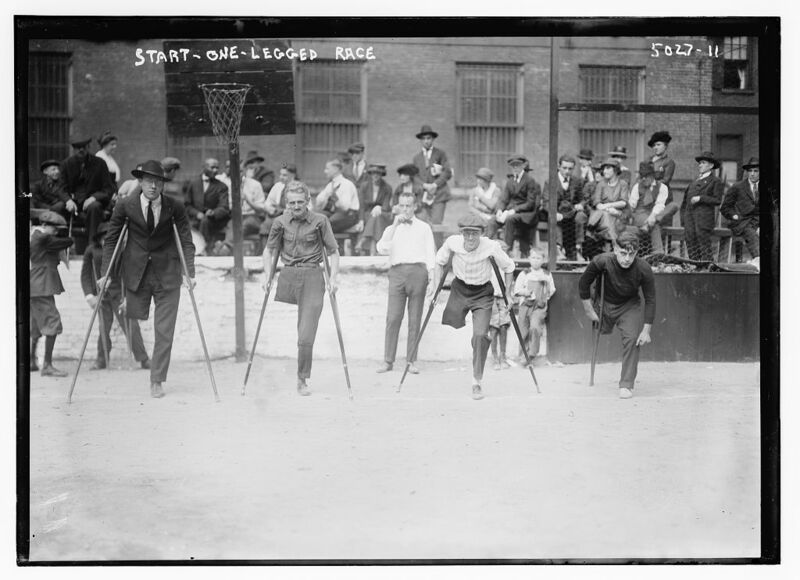 Among the more striking images, there are deaf girls dancing, blind veterans learning to play checkers, one-legged races (where at least one competitor chose to run in full business attire), amputees boxing (a very posed shot, since both men are smiling), and General Daniel Sickles in his wicker wheelchair, shown here at right. Who was he? I was wondering the same thing. Daniel Sickles (1819-1914) was a Union general in the Civil War. Before the war, he was a lawyer in New York City, and a US Congressman; in 1859, while he was a member of Congress, he killed his wife's lover, but was acquitted of the crime, in what is remembered as "the first use of the insanity defense in US history." 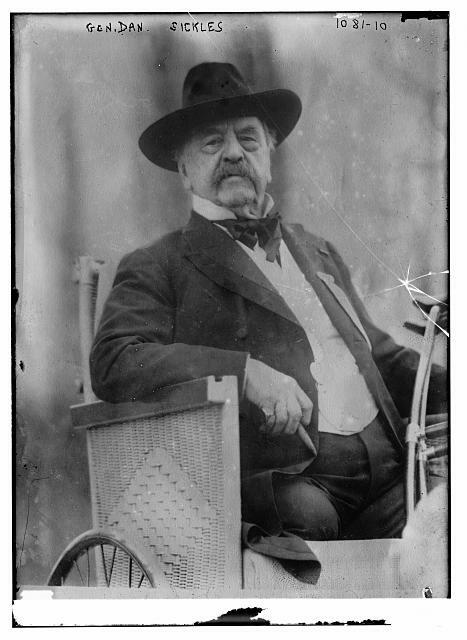 Though he had no military experience, he was a successful recruiter for the Union Army, and was made a general in 1861. At the Battle of Gettysburg, he lost his leg to a cannonball injury. He had his shattered legbone preserved and donated to the Army Medical Museum, where he is rumored to have visited it annually. 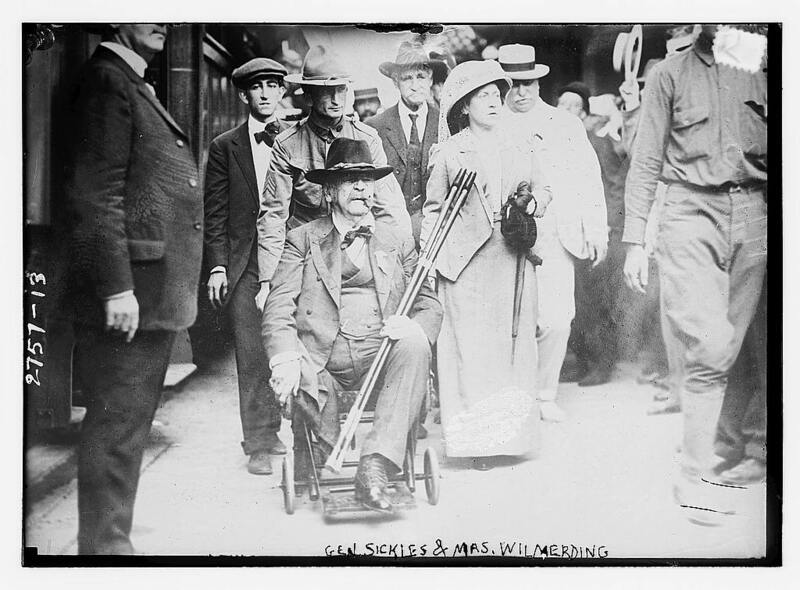 After the war, using a wheelchair (or crutches), Sickles served in various government posts, including another term in Congress (1893-95), and a stint as US Minister to Spain (1869-1873). Sickles lived to the age of 94. 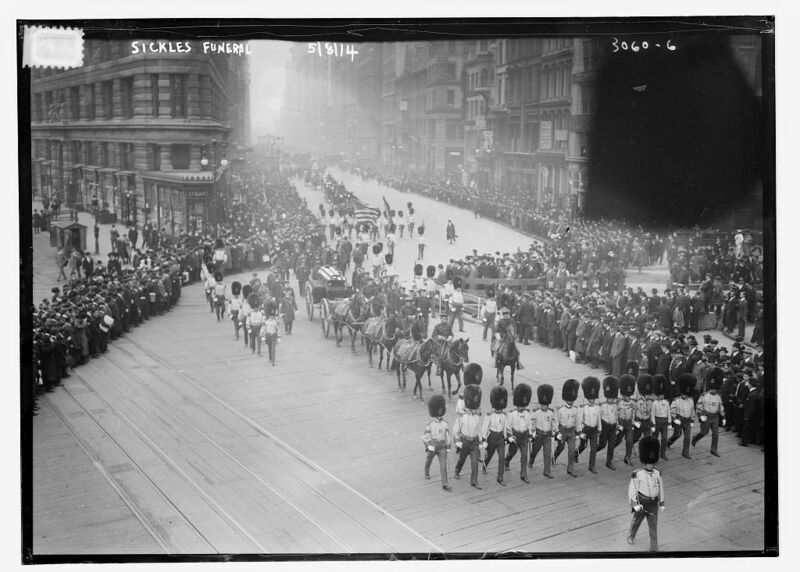 The massive funeral procession of Daniel Sickles is also captured in photographs at the Bain Collection. 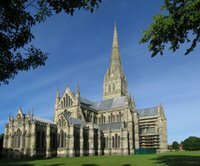 ...women of wealth and education, who pay taxes and obey the laws, who in morals and intellect are the peers of their proudest rulers, are thrust outside the pale of political consideration with minors, paupers, lunatics, traitors, idiots, with those guilty of bribery, larceny, and infamous crimes. I'd like to think we do better now (at least some of the categories depicted in the poster as "legitimate" exclusions from suffrage are now voters, for example). There is a growing literature in feminist disability studies, but in mainstream women's studies and women's history contexts, being in the margins would be a step forward--disability is still, too often, completely invisible, while race, sexuality, ethnicity, and class get full treatment. 1. 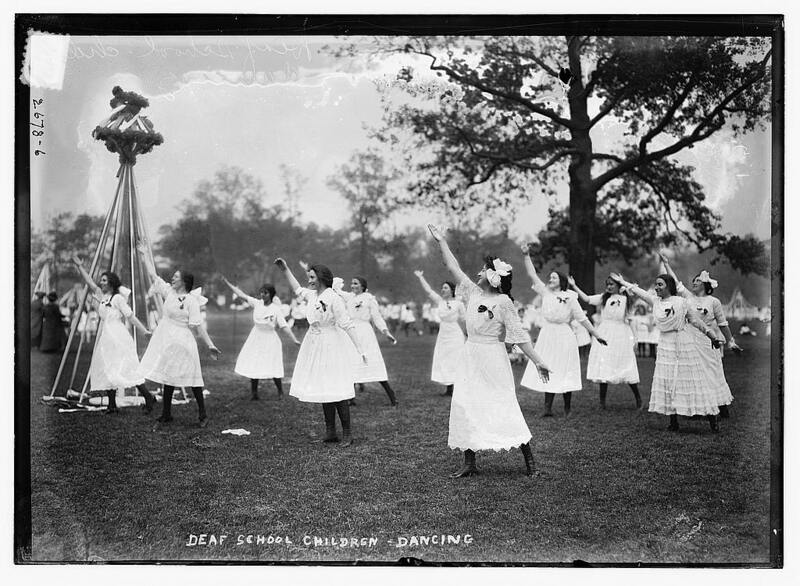 Why not address the disablism in the suffrage movement? Surely we're beyond believing that ignoring the uncomfortable truths is the best way to teach history. There are other missing stories, too: where are the women in the disability rights movement, or Carrie Buck and other women who were sterilized under eugenics laws, or, or, or, or, or.... ? These are interesting stories--important, illuminating stories. 2. Where are the women with disabilities in this and other textbooks? Among the strengths of this text, the publisher touts, "a balanced perspective that reveals the diversity of American women." Or maybe this example of a "balanced perspective" reveals something else.